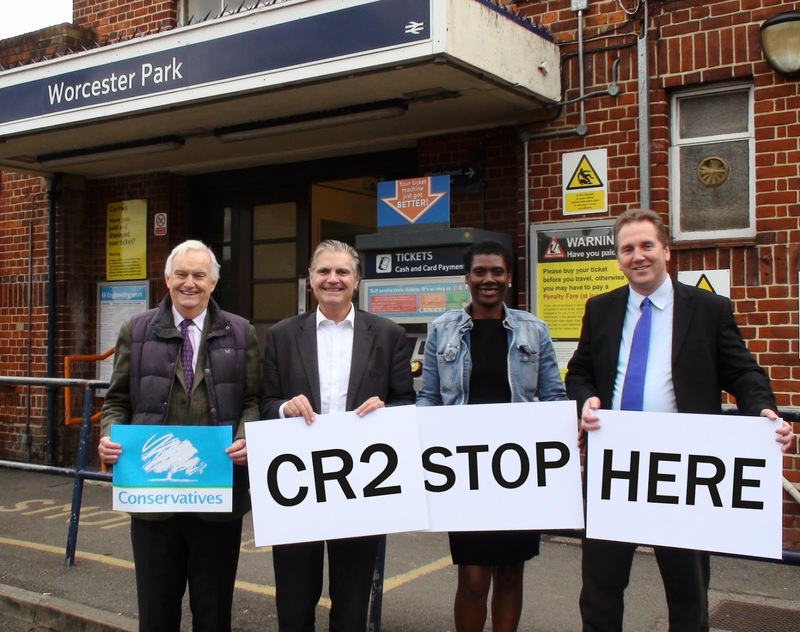 A couple of weeks ago some Lib Dems were spotted at Worcester Park station, apparently gathering signatures on a petition to bring Crossrail 2 to Worcester Park. Perhaps someone ought to point out to them that I ran a campaign for the exact same thing nearly a year ago which resulted in a petition with over 1200 signatures being submitted to Boris Johnson on Wednesday 15th January earlier this year. But perhaps the biggest difference was the nature of the petition itself. Ours was a normal petition asking for name, signature and contact details in order to verify signatures if necessary. We spoke to numerous local shopkeepers who kept copies of the petition in their shops. It's primary purpose was to convince the Mayor of London to bring Crossrail 2 to Worcester Park, for the sake of Worcester Park. The Lib Dem petition was a little different, being a sheet of text with a box to fill in (see below). It seems more interested in voting intentions, finding people to deliver Lib Dem leaflets and raising money for the Lib Dems. In fact you could be forgiven for thinking it's primary purpose was to promote the Lib Dems and it was just using Crossrail 2 as a convenient excuse. The heading (paraphrased) says 'Help the Lib Dems bring Crossrail 2 to Worcester Park'. Call me cynical but what's the chance that if our campaign is successful and Crossrail 2 does come to Worcester Park, the Lib Dems will be saying it's 'all thanks to the Lib Dems' and thanking local people for 'helping the Lib Dems bring Crossrail to Worcester Park'? Well just in case, I want to get in first. I would like to thank everyone who signed our Conservative petition to bring Crossrail 2 to Worcester Park (the petition that didn't ask about voting intentions or giving money to any politcal party etc.) and if we are successful, then thank you for helping the Conservatives bring Crossrail 2 to Worcester Park. Perhaps instead of trying to take credit for other people's hard work, the Lib Dems should consider following through with their promise to get the railway bridge cleaned up and painted. Or did they think we'd forgotten? I will mention at this point that there is currently another consultation going on for Crossrail 2 but it is primarily concerned with three small sections of the proposal that do not affect anything south of Clapham Junction. However there is a box on their consultation survey where you can add your own comments - such as to reiterate that you want Worcester Park to be included as a stop. This can all be found at: https://consultations.tfl.gov.uk/crossrail/june-2014/consultation/intro/view The consultation is due to close on Friday 25th July, so get on it soon if you wish to do that.